Discussion in 'vBench (Works in Progress)' started by Grod, Aug 27, 2016. This is an original Carl Reid sculpt converted by Jimbo for me. I've had a bash at painting it in acrylics and am almost done. stoffy01, Zastrow.cuirassier, Tonton and 16 others like this. peedee, anstontyke and Grod like this. Well done, Gordon......that lace has come out well; always fun on fine braiding ! Real nice paintwork on this complex bust Gordon . if this is you "having a bash" with acrylics i cannot wait to see your work when you get used to them!!! . peedee, Grod and clrsgt like this. 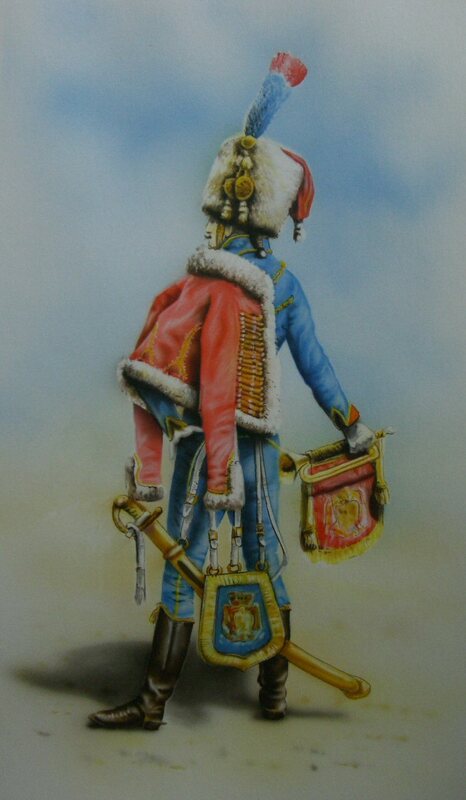 One of my favorite Napoleonic uniforms. Awesome paint job. Like Anstontyke said, I eagerly await to see you work when you get used to acrylics. anstontyke, peedee and Grod like this. Excellent job, beside a small point at his left hand and the trumpet who has some resin bumbs. A very colourful and neatly painted bust. anstontyke, Grod and peedee like this. Colorful and impressive, that's some truly nice work there ! I can't think of anything more because the others have already said what I was thinking mate. You told me you loved doing this and it shows. Chris Ribchester, anstontyke and Grod like this. A very nice figure with cracking painting. anstontyke, Grod, napoleonpeart and 1 other person like this.